A bowl of “Spanish latte” sipped across from the lovely UrbanAmazon herself! I love autumn! As the leaves are changing, the air turns brisk, sweaters are coming out of storage, and a magical transition takes place for me. I can start drinking hot coffee and tea again! It’s possible I love coffee and tea even more than the “fresh start” feeling of fall. Sure, I’ll drink iced versions during the summer. And on particularly masochistic days, I might even drink the hot version, but I still long for cold mornings with a hot mug between my hands. So, it should come as no surprise to you that my kitchen is FILLED with options for the hot beverage category. Whether it’s the hardware involved in the brewing thereof or the tea leaves and types of beans, my apartment is a wonderland of steamy drinks! I always drank tea and coffee throughout my life, but during a hiatus from coffee as an adult, I started really exploring the full world of tea and its preparation. Black, green, red, white, herbal… There are so many options, I find it hard to believe that there isn’t a tea out there for everyone! Because it’s so much grounds (Grounds! Coffee joke! HAH! -Thanks, Tim!) to cover, I’ll be breaking up this article into two parts; coffee today, and tea next week. Admittedly, I have an emotional addiction to coffee; it brings back warm memories of my mom sipping coffee with friends throughout my childhood. But depending on which studies you read, moderate coffee consumption is also good for you! It can decrease likelihood of dementia and Alzheimer’s, lower the risk of certain types of cancer, and the caffeine in a cup of coffee can help alleviate a migraine or an asthma attack. As with anything there are also some drawbacks. Coffee can also hinder iron absorption, aggravate GERD, and cause stimulant dependence. 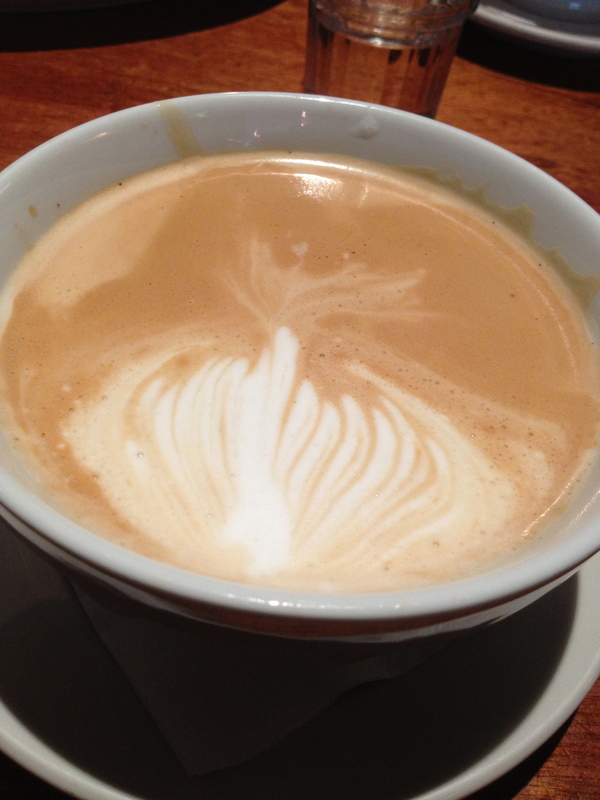 For something that is fundamentally so simple, coffee can become very complicated. I am not such a snob that I won’t grab a deli coffee on my way to the subway but I do love good product made with attention to detail when it’s available. And it’s very easy to make sure you can brew yourself a lovely cup at home for pennies. Drip is what we generally find here in the USA. The rest of the world is baffled by the concept. In fact, if you ever see an “Americano” on the menu in a fancy coffee place, what you’ll be getting is espresso that’s cut with hot water. That’s the European impression of it. But I stand firmly by my homeland’s preference. I love a basic cup of coffee. It gives me more time to linger and chat than an espresso. When it’s brewed fresh with good beans, and not left to languish on the hot plate for hours, even decaf can be a lovely thing. With most standard issue coffee makers, water is boiled, creating steam which condenses over medium-grind beans allowing yummy coffee to drip down through the grounds and then through a filter, carrying the best parts of the bean into a carafe, ready for consumption. I personally use a single cup filter for my daily coffee. I just slowly pour hot water over the grounds and let it drip directly into my mug. Very low-tech and every cup is fresh. My preferred proportion is a heaping tablespoon of grounds per cup of water (actual measurement cup, not mug). Crema from a fine espresso machine. -Thanks, Art! 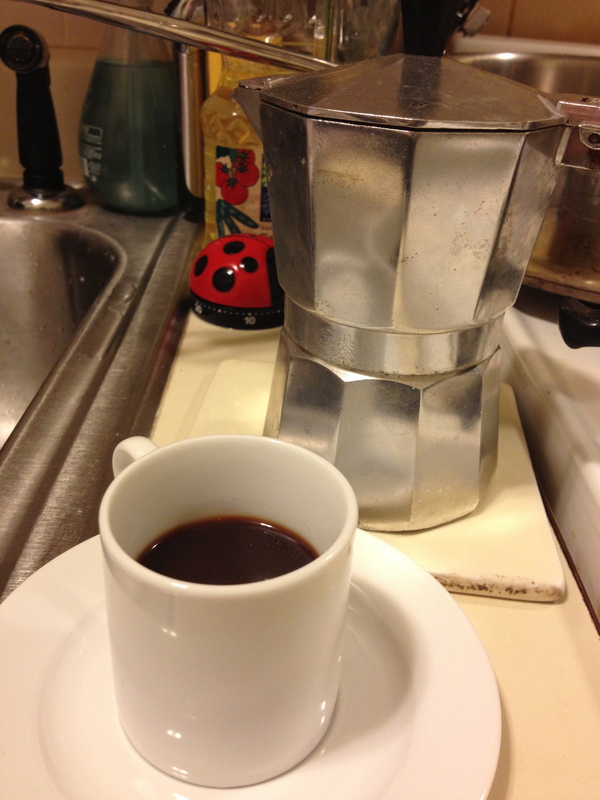 Espresso is the classic Italian preparation of finely ground beans. Whether it’s from a machine or a stovetop pot, like mine, the idea is that hot water is forced through compressed grounds, creating a thicker, more concentrated coffee. 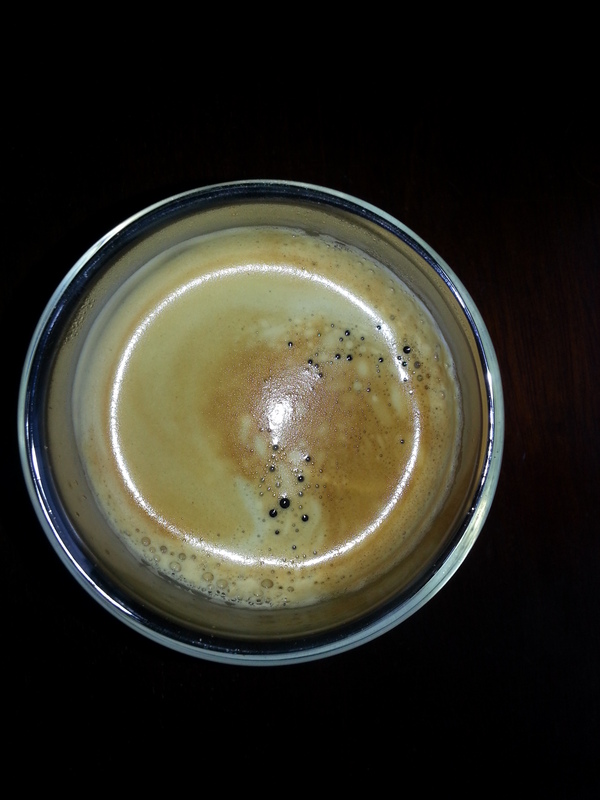 Because the process is pressurized, you get what’s called “crema” on the top of a good cup of espresso. It’s white and brown foam that’s the result of the force of brewing. Espresso fanatics will go on and on about crema if you let them! If you order café in almost any country outside the US, this is what they’ll bring you. Once you have the basic espresso, there are a myriad of options regarding the proportion in which you add milk and/or milk foam, if you want it. That’s where the fancy coffee places can be off-putting to a lot of people. It’s a lot of vocabulary and a lot of funny pronunciation to learn. And as I’ve learned, the terminology for what YOU like can vary even from town to town in Europe. Me? I like a milky coffee without foam, so depending on where I am, it could be latte macchiato, café crème, renversée, caffé latte… the list goes on. Don’t be intimidated. Just tell them what you like and let them figure out the name. 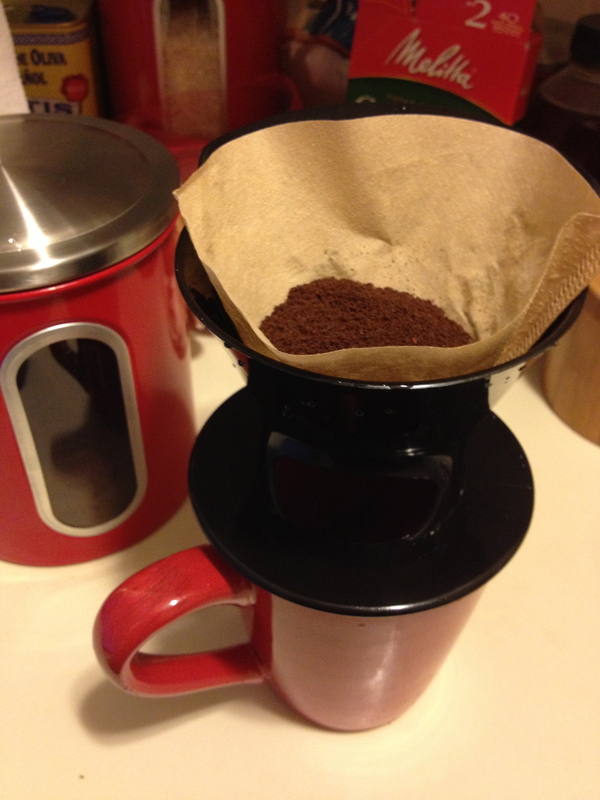 French press is a very popular home method of coffee brewing. Its process is not dissimilar to brewing tea. A coarse grind is the best choice for this method, and a lot of people prefer a dark roast. Grounds and hot water (preferably just short of boiling) are allowed to steep in a French press pot for a few minutes before pushing down a plunger which drags a filter through the pot, capturing all the grounds at the bottom, allowing the drinker to pour a non-chewy cup of Joe. I’ve even seen some travel mugs fitted out with a French press-style device! Turkish or Greek coffee is the finest grind of all. It’s really a powder at this point and will become silt in the bottom of your cup. A special pot with a narrow neck called an ibrik or cezve is used for the brewing of this coffee. If you choose to add sugar, it must be done during the brewing process. A teaspoon of coffee for each espresso-sized cup of water are put into the pot with whatever sugar you prefer and set to boil. According to my Serbian friends, it’s appropriate to bring it just to the boiling-over point (this is very exciting and happens quickly because of the shape of the pot) and remove from the heat three times to honor the Holy Trinity before pouring into espresso-style cups and allowing the silt to settle on the bottom. Never stir your Turkish coffee. You won’t be happy. Drink right down to the silt, and if you’re lucky, you’ll have friends who read the grounds like one would tea leaves. It’s a stimulant AND a fun party game! In the summertime, I’m a huge fan of the cold brew process. In addition to making great iced coffee, it also makes a lower acidity coffee concentrate that you can turn into hot coffee. The values of acidity are up for debate in the quality of coffee flavor, but if you have acid problems to begin with and still love your coffee, this is a good way to minimize the pain. It’s as simple as just letting very coarsely ground beans sit at room temperature in water for 8-12 hours. After that, you filter out the grounds, funnel the lovely elixir into a container for storage in the fridge, and use at will. I usually use a wide-necked gallon container to 1lb. of beans for the soaking process. Water is going to make up the bulk of your coffee, so make sure you’re starting with fresh, cold, good-tasting water. If you have iffy tap water, use filtered. Employ your Brita. You’ll hear people talking a lot about roast when it comes to coffee. What makes a good roast is really a matter of personal taste. I tend to prefer a medium roast for drip coffee, but love a dark roast for espresso. In order from lightest to darkest, here are some common names for level of roastiness: Cinnamon, New England, American, City, Full City, Vienna, French, Italian, and Spanish. Fun fact: Despite how some people get all excited about getting hopped up on the over-roasted charcoal swill available at certain popular purveyors of coffee, the darker the roast, the less caffeine! Origin of beans can also make a difference. As with wine, the terroir of the beans changes the flavor. The altitude, humidity, and natural minerals in the soil all make a big difference. Some of the best coffees I’ve had came from Central America, but there are great coffee sources all over the world. It’s good to try things out for yourself. If there’s a snobby coffee place in your area, ask if they ever do tastings (cuppings) or informative seminars. Storage is very important when it comes to keeping your beans in good shape. Coffee does not last forever. It is an organic foodstuff that will degrade over time, and rather quickly, I might add! From the moment beans are roasted, they start losing their magic. So, the sooner you can get them after roasting, the better (or if you need a new hobby, start roasting them at home!). Fresh grinding is also awesome. Do I always do it? No. I also buy canned espresso, so there. Buy fresh. Check the date on the bag. Go to a knowledgeable provider you like and trust. Don’t buy too much. As a perishable, it won’t serve you to buy in bulk. It’ll just be all stale by the time to get to it. Start monitoring your coffee making habits and try not to buy more than you need for the next two weeks. Air-tight storage. You want to be sure that air isn’t getting in and drying out your beans and hastening their decline. Rubber seal canisters are great for this. Climate maintenance. The freezer is ok for extreme circumstances, long-term storage if your beans are properly sealed, but I wouldn’t recommend it for every day. The constant temperature fluctuations mess with the beans chemically and encourage condensation which degrades the beans. Also, brewing from room temperature beans is better for flavor. Don’t be afraid to chuck it and start over. If your beans have gone over the hill or if you just don’t like them, it’s ok to move on. So, that’s my intro to coffee. We’ll talk about tea next week. If you have specific questions or if I’ve left something out that you think is super important, please share with me and your fellow Amazons in the comments section!